It's an old 80's (I believe) Craftsman hobby scroll saw. It uses 3" pinned blades, has a tilting table, a nice long throat, and something I've never seen before: A mount for a disc sander! The seller of this saw complained that it didn't cut smoothly. When I got it home I discovered why... The saw blade had a kink in it. A quick run to Ace Hardware for blades and I was cutting smooth. 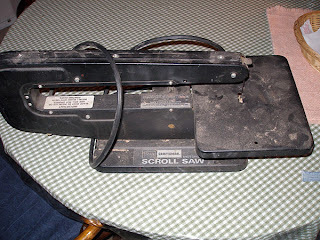 I do have a couple issues with it, though they could be because I've never had a scroll saw before. The first thing is mass. Because it's a hobby saw, it doesn't really have enough mass to be stable during use. I found clamping it to my bench made a real difference. Second is noise. It's MUCH louder than either of my handheld jigsaws. This could also be a function of the lack of mass. Last is the blade jams easily. It grabs the wood and the wood with the blade attached goes up and down instead of just the blade. I think it's a horsepower thing. This saw is only 1.4 amps, not much power. But the good news is that with care it works quite well. I've mostly just done 'foolin' around' cuts to learn how to work with the saw. Avoiding the blade jams was a technique I really needed and I think I have it down now. Hopefully soon I'll be able to apply it to a neat project! Have you any thoughts on making a leather top writing table? Haven't yet messed with leather. I do plan to soon though.